Analytics industry in gaining importance in India and is being deployed across various sectors such as banking, finance, e-commerce, retail, and telecom. Tapping on to the growing analytics industry, the study gives us a quick insight into how the analytics scenario is evolving in the domestic market. This year’s study has been co-presented by Cartesian Consulting, a global analytics services firm specialising in customer, marketing, and business analytics. We looked at 20 large Indian firms across industries that have adopted analytics to improve business. There are three major players — service providers (who provide analytics services to the end consumer), captive centres (back offices that do outsourced work) and the domestic market. Service providers have been dominating the analytics market (their share of the market is ~75%) for quite some years and it is only now that the other two players are becoming equally competent. In fact, the domestic market accounts for just 5% of the Indian analytics market. Armed with their own analytics team, these firms use analytics for their internal processes. Like last year, it is the private banks such as Kotak Mahindra Bank, Axis Bank, ICICI, HDFC, Yes Bank that are deploying analytics extensively. Among the public banks, SBI is the most analytics savvy. In the insurance space, Max Life Insurance leads the pack. Among the ecommerce players, the frontrunners are Flipkart and Ola, while Patym and Zomato lag substantially. In telecom, Idea Cellular has embraced analytics faster than big players like Bharti Airtel. In the automobile sector, Mahindra Group and TATA Motors are upping the game. Considering the relative focus on advanced analytics by other conglomerates, Aditya Birla Group, Reliance Industries, L&T, ITC have a decent focus on analytics. 44% of all analytic functions for Indian firms are based out of Mumbai. 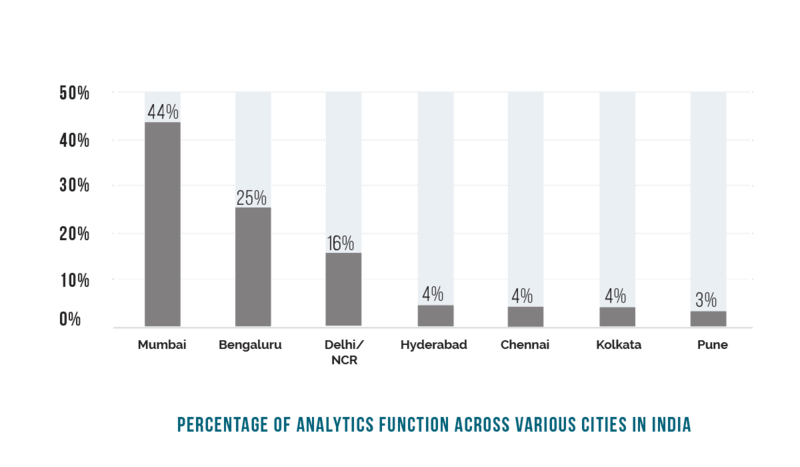 Almost 85% of analytics functions are based out of just three cities – Mumbai, Bangalore & Delhi/NCR. The top 10 schools from which Indian firms recruit their analytics teams are: University of Mumbai, Delhi University, NMIMS, IIM Calcutta, The Institute of Chartered Accountants of India, IIM Lucknow, IIM Bangalore, IIM Ahmedabad & ISB Hyderabad. On an average, Indian firms have an analytics penetration of 1.7%. This essentially implies that for every 59 employees in the organisation, one employee is associated with data and analytics. Analytics penetration is typically higher in new age ecommerce firms and lower in traditional businesses. The average tenure of analytics professionals in Indian firms is 3.4 years. TATA Motors boasts the highest tenure among India firms, whereas new age ecommerce start-ups have a much lower analytics tenure. On the other hand, advanced analytics/ data science as a percentage of total analytics function is higher in new age ecommerce firms in India and lower in traditional firms. On an average, analytics professionals in Indian firms have 8 years of work experience. Zomato has the lowest seniority in terms of analytics professionals in India firms. TATA Communications has the highest seniority. Like last year, there is a slight negative correlation between maturity and penetration. Flipkart is the only company in the first quadrant, which implies it is both high on penetration and maturity. Given Flipkart was amongst the first companies in the ecommerce space to adopt analytics, it has ramped up its practice both in terms of size and quality of work. Most companies seem to lie in quadrant III. This could be attributed to how just few analytics companies have aggressively adopted analytics. Mostly, the new age ecommerce firms like Ola, Paytm & Zomato took a very aggressive stance on their analytics function last year, also coupled by large funding budget they had. Zomato tops in analytics penetration and is lowest in analytics maturity. Sitting at the bottom of quadrant III, SBI’s analytics penetration and maturity profile suggests the bank needs to push itself harder if it is to compete with private banks in ranking. TATA Communications has the highest analytics maturity of all domestic firms in India. Quadrant III has many banks – Kotak Mahindra, ICICI, Yes Bank, HDFC and Axis Bank. It would have been great to see them building their analytics capabilities quicker than their older peers in quadrant II. While ecommerce firms have the highest analytics penetration of all sectors, they have the lowest maturity. Analytics build-up for ecommerce is so high that it makes other sectors appear in an almost vertical line (having the same penetration). Massive analytics build-up by mostly new age firms also means that the focus on maturity in terms of tenure, seniority and advanced analytics is yet to kick in. Automobile firms have the highest maturity and banking firms the lowest. Max Life Insurance has emerged as one of the largest adopters of analytics since last year’s list. It ranks highest in terms of analytics maturity, higher than most private sector banks. Axis Bank has higher analytics maturity compared to ICICI, HDFC and Kotak Mahindra. SBI has the lowest analytics maturity and analytics penetration. ITC has the highest analytics penetration of all other companies in the domain, yet it has the lowest maturity. 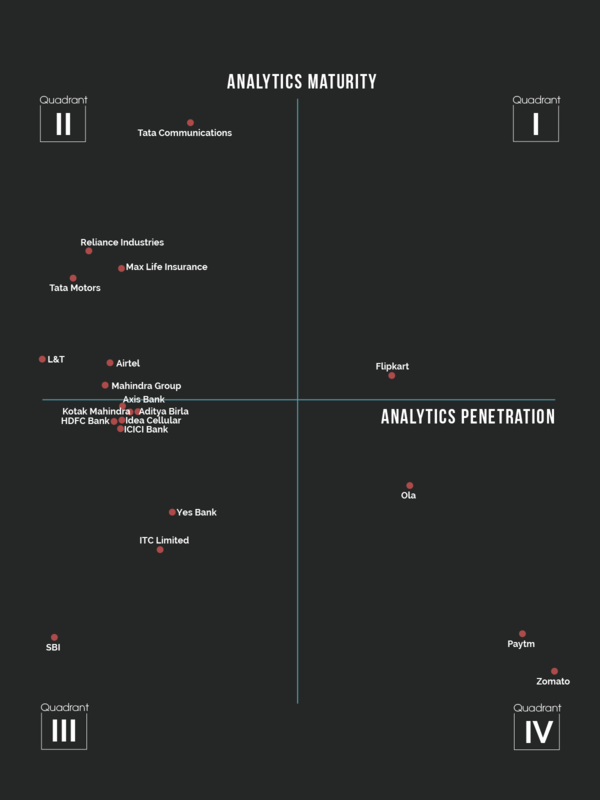 Reliance Industries leads in terms of analytics maturity whereas ITC is the lowest. Mahindra Group has a relatively higher analytics maturity than Aditya Birla Group but lower analytics penetration. In terms of focus on advanced analytics and data science, Reliance Industries is ahead of the pack. Ecommerce firms are biggest adopters of analytics and they are focussed on hiring senior analytics professionals. Flipkart is a leader in the ecommerce segment with a significantly high analytics maturity. It, however, lacks in terms of analytics penetration, which is led by Zomato followed by Ola. Zomato, however, lacks in analytics maturity. The analytics build up is highest in Flipkart. Both in terms of analytics maturity and penetration, TATA Communications is ahead of big players such as Airtel and Idea. This can be attributed to the fact that the company boasts the highest number of senior analytics professionals and also to their focus on advanced analytics and data science. Idea has the lowest analytics maturity.